This post idea came to me after reading this WordPress’s Daily Prompt “What’s the one piece of advice you wish someone had given you years ago?” Mine? I don’t know when I first read this poem. Probably during my teens. It gave me a wake up call. 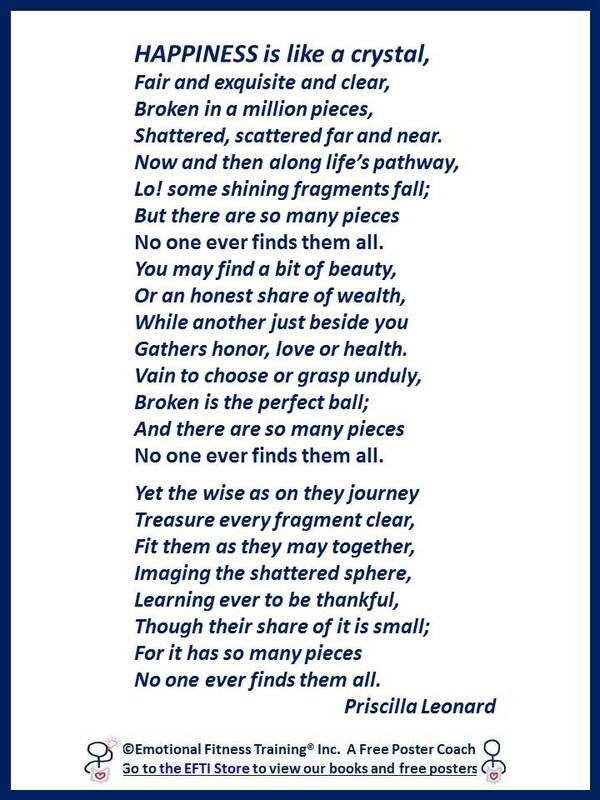 Life always provides pain, this poem helped me appreciate the good and that strengthened me for enduring the bad. I wish with all my heart the media and happiness gurus were spreading this gospel instead of their “Just Do” it rants. The younger the child the more s/he lives in the now. A newborn baby is a very good Buddhist. Very soon children learn to fear pain and to shy away from what hurts; some become bullies or vengeful. Understandable, but a life without pain is a comatose life and seeking it is as delusional as trying to find the pot at the end of the rainbow. How to self-sooth so when life is not to their liking they don’t retreat or turn mean. How to code reality, meaning learning to think more clearly than feelings allow. With all the emphasis on happiness circulating around those dispensing advice to parents, pain tolerance is neglected. Not good. How do you build pain tolerance in your children? Here are three parenting tips that will help. Parenting tip two: When language develops more direct teaching can begin. Teaching Calming Breath starts the process. See the Breathing Buddies link below. As pain can lead to the desire to hurt others, it is also important to teach making amends and forgiveness. Parenting tip four: As always you need to model what you teach. Bad news? Not really for by learning to self-sooth and remember what matters you will increase your ability to tolerate pain and add to your ability to enjoy the good. You can download a copy of Priscilla Leonard’s poem free at the EFTI store. It is one of my poster coaches. EFTI’s poster coaches are free digital downloads designed to improve #Emotional_Intelligence. Best printed up in color on 8″ by 11″ card stock. the posters can be posted almost anywhere. Some people frame theirs. My intended audience? Anyone who wants to improve their emotional fitness or anyone else’s emotional intelligence. Parents, teachers, therapists, coaches, fitness trainers, school guidance counselors, preachers, and non-preachers. This entry was posted in Parenting Issues and tagged Challenged Children, Emotional fitness, Health and mental health, help for parents, Katherine Gordy Levine, Pain tolerance, parenting, Parenting advice, postaday, teens. Bookmark the permalink.